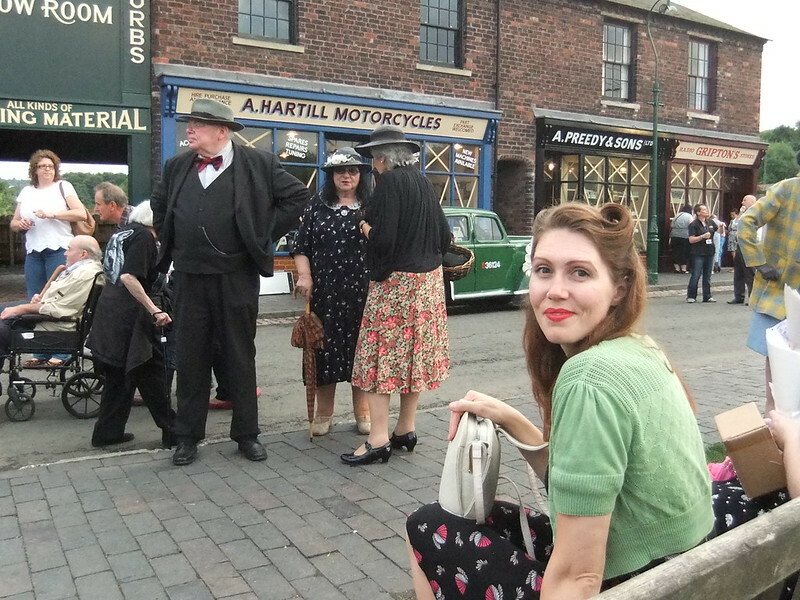 The other weekend I had the abssolute delight of attending my first 1940's Weekend, at the Black Country Living Museum in Dudley. Tickets for the event were cheap as chips (£25 per adult for the weekend), and the sourcing of a budget hotel within walking distance meant that it wasn't going to break the bank. The weekend promised two days and one evening of events, with music, air-raids, displays and acting. We arrived on the Friday evening and as it was a scorcher headed to a local park, Priory Park, that proved the perfect picnic spot - lovely grounds, the ruins of a Priory, all set within a 1930's estate with a college and lots of housing, so perfect for architectural tourism. A lovely evening was had soaking up every last ray of sunshine. On Saturday the heavens opened! We were awash. 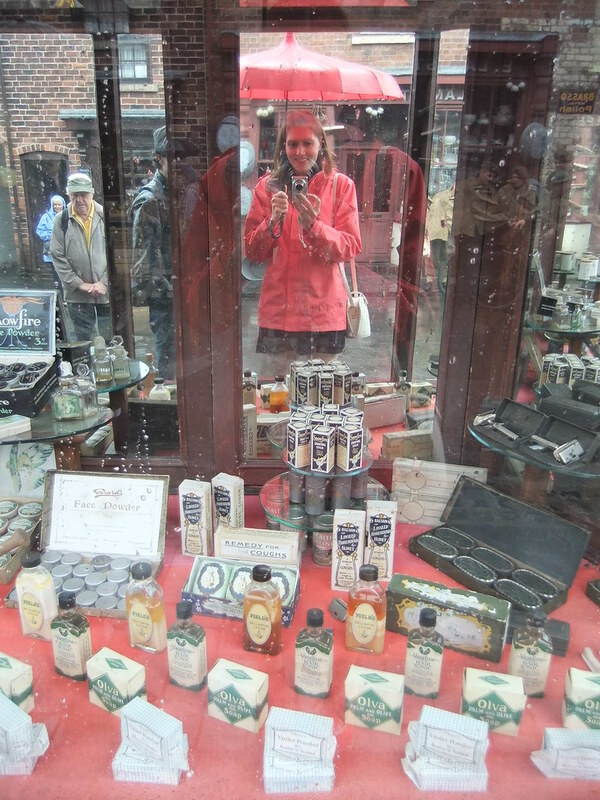 I set aside all notions of wearing my 1940's style sundress and reluctantly reached for a sporty dress, waterproof jacket, sensible trainers, and a big brolly. I'm glad that I did dress sensibly, as I think I would have become quite miserable otherwise - the rain was pretty relentless all day. 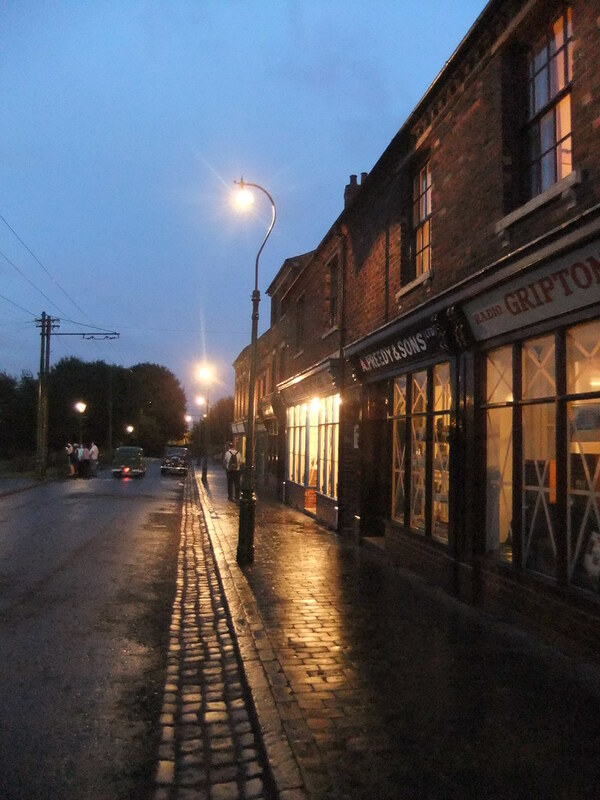 Our spirits were far from dampened though as the atmosphere at the museum was fantastic. 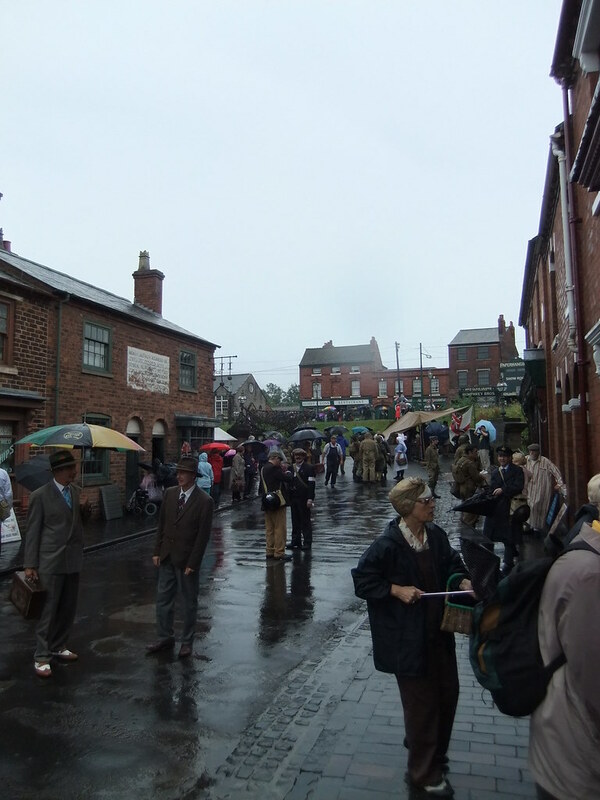 I was impressed with how many people had made the effort and came in original '40s clothes, hats and all. I did feel embarrassingly underdressed, but knew we were coming back for the evening event and vowed to make an effort for that instead! I wore a tea dress from Peacocks in the evening, and my Baby went all out in a 3 piece suit and Homburg (none of it 1940's, but it looked great nonetheless). I was a little nervous about vintage snobbery - some of the rockabilly weekend's that friends go to have a bit of a bad rep for people frowning if you're not wearing the 'right' thing - but I have to say that everyone was very nice, and people kept thinking that we did this kind of thing all the time. So I breathed a sigh of relief in my modern attire. The museum is an open air museum with a selection of buildings representing the industrial and domestic heritage of the area (a bit like St Fagans in South Wales if you're familiar with that one), and is worth going to even when it's not a special event as there is a lot to keep you entertained. 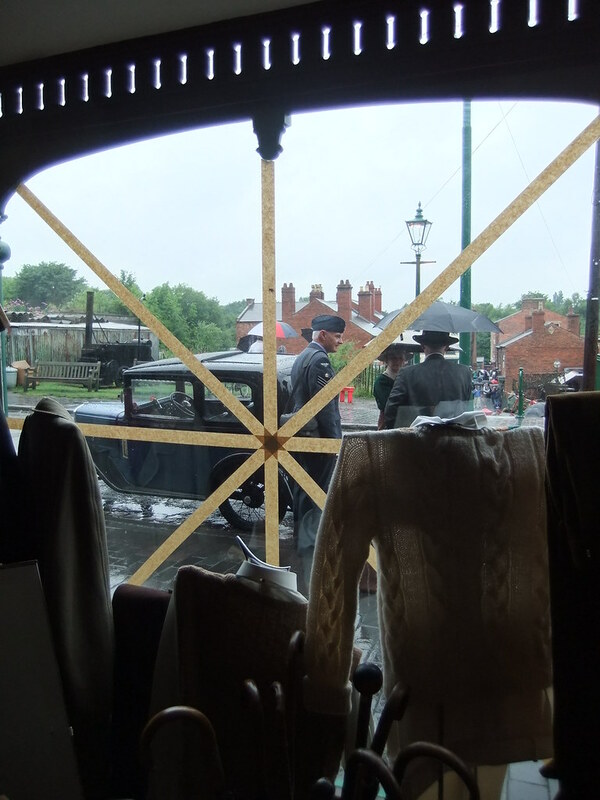 They did go to a lot of effort to make the whole place seem more '1940s', with little touches like tape on the windows. One of my favourite vintage retailers, Vintage and Revival, had a stall at the event, and I had a good rummage in their rails. 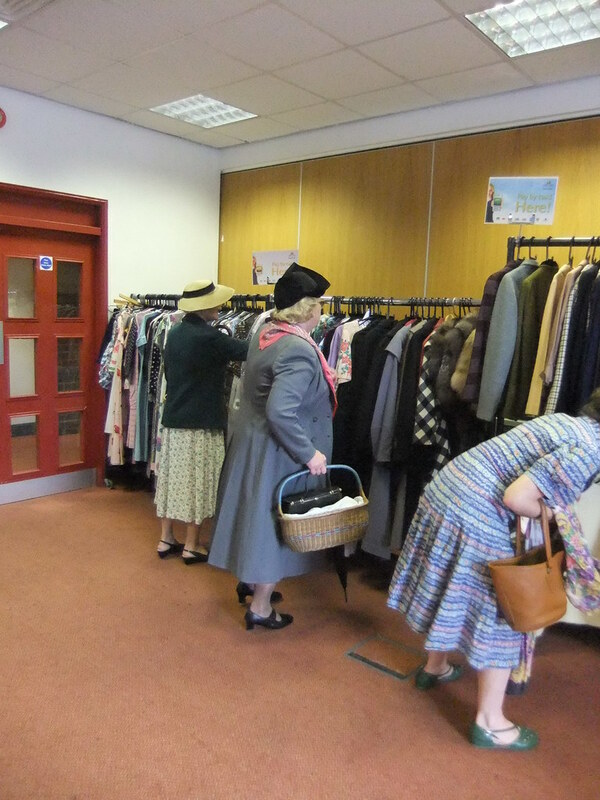 They specialise in original 1940's clothing, and had a fantastic selection at very reasonable prices. 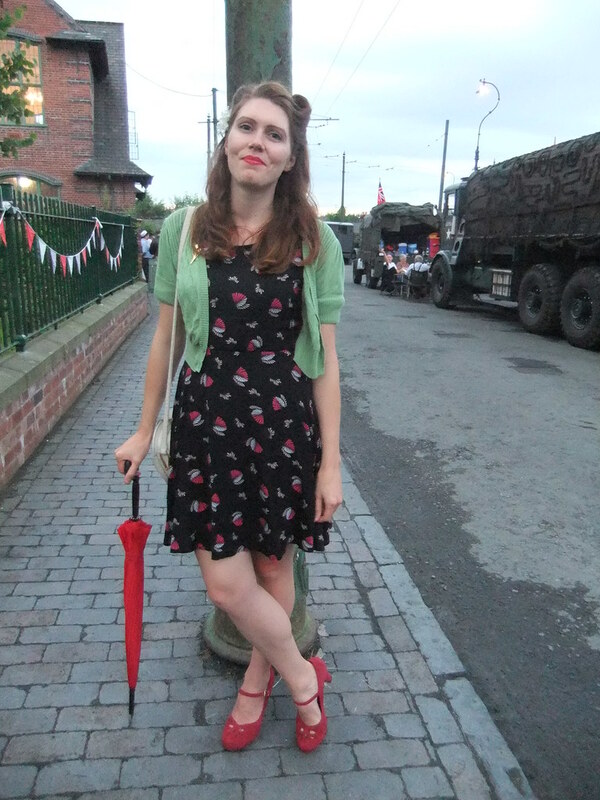 The average '40s dress is £65, and I bought one from them years ago that has been an absolute winner. 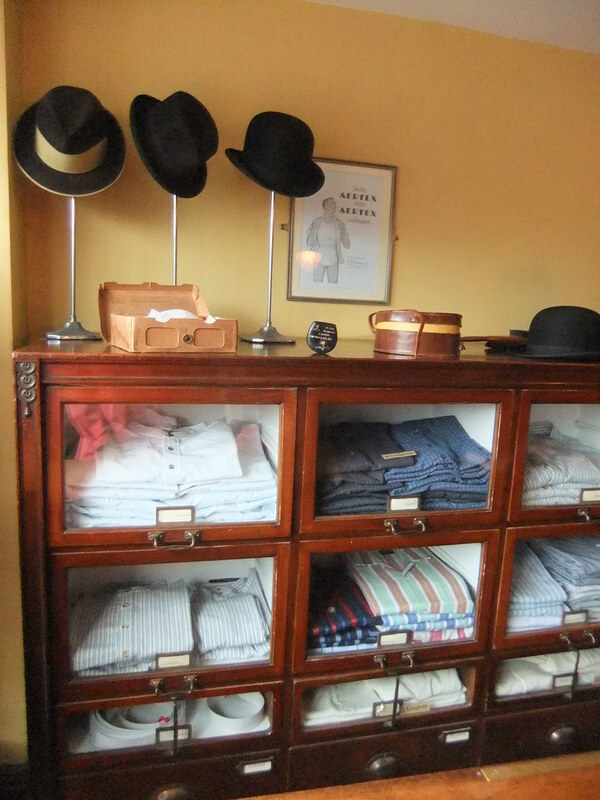 There was also a lady there selling the most wonderful hats, handmade by her as 'a hobby that got out of hand'. I was so impressed with them, but couldn't think of where to wear them or what to pair them with. I am on a bit of a spending ban at the moment also, as we're going on holiday soon and I am saving my money for that, so it's with regret that I didn't purchase anything! We didn't end up going back to the museum on the Sunday as I wanted to go to Dudley Zoo, and make the most of seeing different things on our brief trip, but the evening event on the Saturday was wonderful with more al fresco snacks, great music from The D-Day Darlings, and a magical gaslit street at the end of the night to wander home along. All in all, we had the most wonderful time. 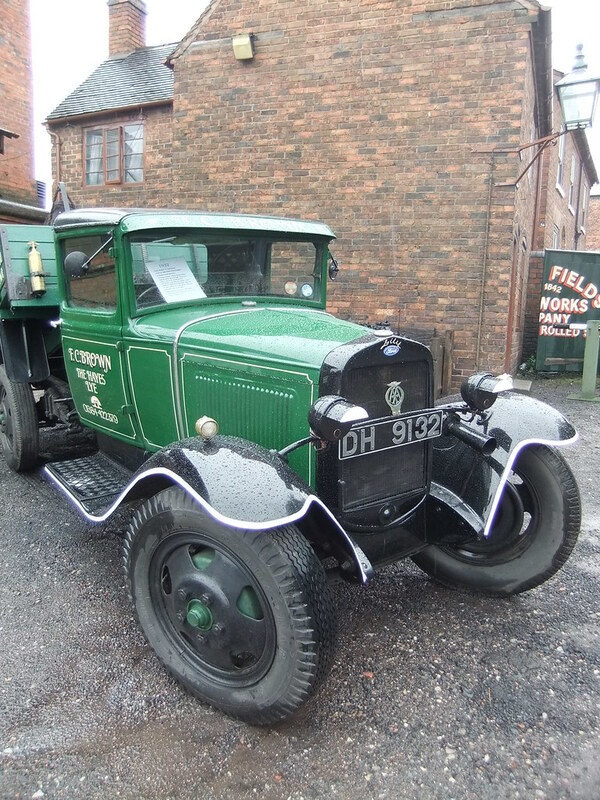 The museum will be running the event next year as well, so if you're interested then I'll repeat that tickets are only £25 each for the whole weekend, including the evening event, and that we got a bargain room at the Quality Hotel (a mile or so's walk away) for £85 for two nights. 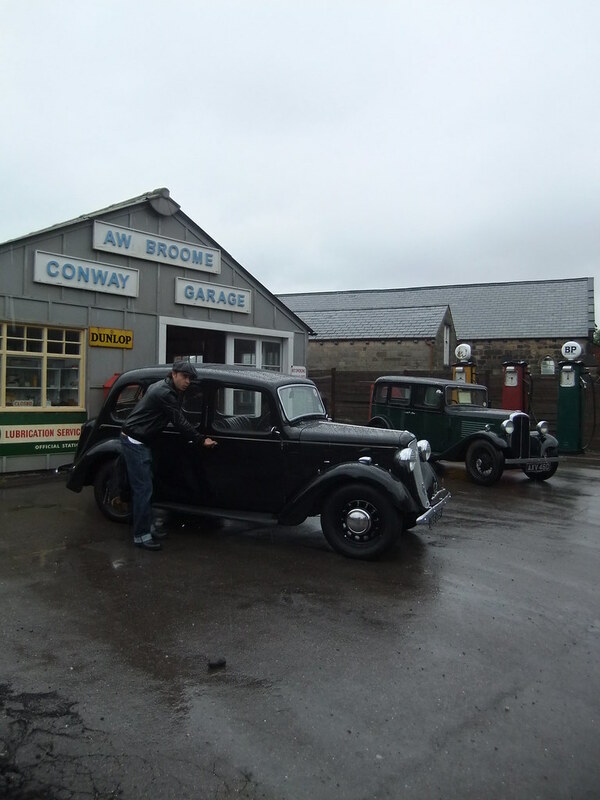 I'm really tempted to go back next year, or maybe go to a different 1940's weekend to try something different! 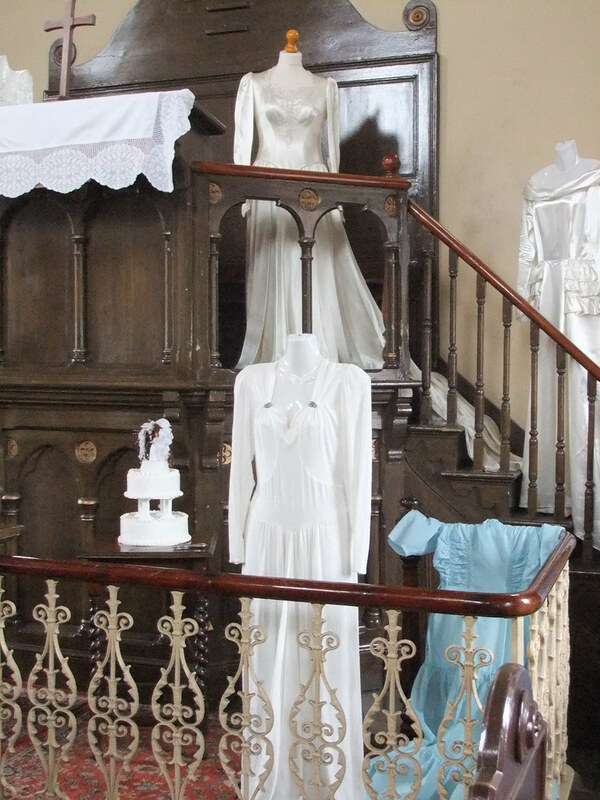 Have you ever been to a 1940's weekend? Great pics - and I think your outfit looked perfectly period without being the real deal. I'm always that person at these things in modern gear thinking everyone's judging me - but I think no one really knows/cares/minds as long as you put the effort in ;) I love the colours you put together - and your man looks ever so stylish! A 40s weekend sounds like so much fun! It's too bad about all of the rain, but I'm glad that you had a great time nonetheless. And even though your outfit wasn't period, it's still really cute - love the fan print on your dress, as well as your dapper dude. It looks like a lovely place. I love both your outfits too! Would love to go to something like this but alas the closest thing to this in my area is the war of 1812 reenactments. This looks like so much fun! I love your outfit and those victory rolls are perfect! How cool! And you look adorable! That looks like a brilliant weekend, and I'm glad people were nice. 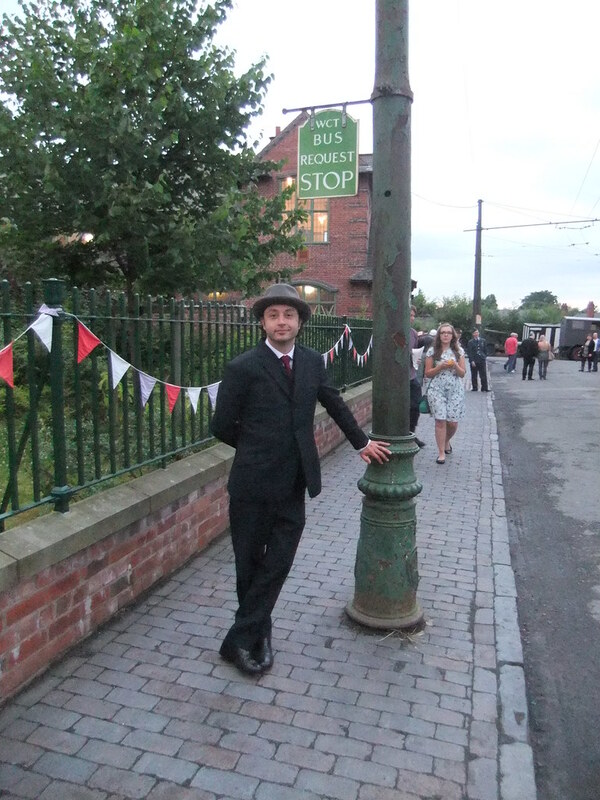 I've never been to a 40s one, only a rockabilly weekender, but I found people friendly there too. Wow! Looks like fun! And I ADORE your sweater!